Preventing freeze-ups, clogging and corrosion The Expello Air Products Air Dryer system helps prevent brake line freeze-ups, clogging, deterioration and corrosion in an air brake system. It removes oil, carbon, dirt, sludge, and gets the water out! These air dryers are both a filtering and coalescing system. They remove 100% of solids larger than 1 micron in size and 99.9% of all compressor “blow by” oil. The Expello Air Products Automatic Drain Valve eliminates moisture in compressed air systems. The valve replaces the manual drain petcock on any air tank within a vehicle’s compressed air system, whether the tank is on a vehicle or trailer. 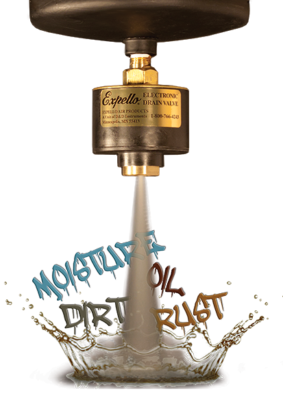 The Expello valve purges water, dirt and oil from the air system in a quick, 1-second burst, every 5 minutes of vehicle on time. That means clean, dry air and an end to frozen air brakes.